We never thought the words creepy and vegetarian could ever be used in the same sentence in a contextually sound way. But really, this Vegetarian Spider (the only vegetarian spider) is very seriously creepy. 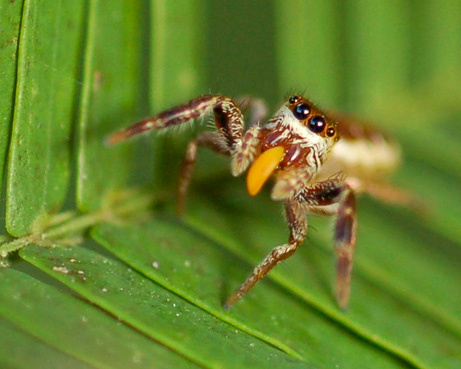 The Vegetarian Spider is a species of jumping spider that favors the buds of acacia plants, among other green items in tropical southeastern Mexico and Costa Rica where it lives. I’ve actually never found these little fellas creepy at all. Of all the species of spider in the world, jumping spiders( in my opinion) are definitely the cutest. i hate spiders but since this one is a vegitarian i could subside with it! What the heck in the mouth. Is it a vegetable? Ummm, Technically it is an arachnid, not an insect.